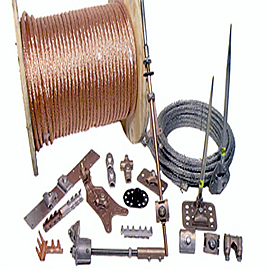 ﻿ Lightning Ptoection Parts and Materials from Ohio Valley Lightning Protection, Inc.
"The more you order the better the price..."
Just because you do not see what you are looking for doesn't mean we don't carry it. Best Prices and Quality on Material in the Business! Call Today we will give you the best price. All materials and products are made of the highest quality Aluminum, Copper and Bronze is also available. All products are listed with Underwriters Laboratories. Please CALL FOR THE LATEST PRICE ON ANY LIGHTNING PROTECTION PRODUCT OR PART.